February was a disaster for Ontario's electricity consumers - but not nearly as bad as it will be for Ontario's natural gas consumers. The increased HOEP is entirely a natural gas supply story: the victims in the story are the largest consumers in Ontario. The Toronto Star carried an article last week, Ontario's big industries plead for lower hydro rates, expressing the concerns of the Association of Major Power Consumers of Ontario (AMPCO); those consumers are likely to see rates for February 2014 about 50% higher than a year earlier. AMPCO had lobbied in 2010, successfully, for a scheme in allocating the costs of supply, not captured through the market HOEP charges, that would benefit their membership - but this winter's sudden shift in cost recovery back to the HOEP has greatly wiped out the cost savings they had been experiencing due to that change. Ontario's official opposition party recognizes the threat of higher electricity pricing to the provincial economy, but the Minister of Energy continues to dismiss concerns even as his lack of an energy policy drives prices, particularly those for industry, rapidly higher. In December the province released what they incorrectly titled a "Long-Term Energy Plan." All the terms in that reference are questionable, but the relevant misuse today is of the word "energy"; to the extent the document presented a plan at all, it was an electricity plan. The province's long-term desire to get rid of coal-fired generation was largely accomplished at the end of 2013, as the units remaining in operation at Lambton and Nanticoke were retired a year early. Luck was not with Ontario as a cold winter accompanied the loss of coal, putting an enormous load on the natural gas fuel that heats most homes in the province. It appears nobody was managing Ontario's natural gas inventories, setting up an extraordinary February where electricity prices were both often below $20/MWh, and frequently about $200/MWh - based almost entirely on whether the province's non-gas generators would meet demand, or if the supply setting the market control price was natural gas-fired (increasingly, throughout the month, imports pushed out scarce natural gas). People with natural gas bills to pay should note that, in Ontario, the prices are regulated and the cost of gas is a pass-through (your utility doesn't make money on the commodity). This usually works well for consumers, but in this case the utilities will be recovering the full costs of purchasing expensive gas this winter in upcoming rate applications. It is also likely that most of the gas-fired electricity generators in the province treat gas pricing as a pass-through cost. Again, that usually would benefit consumers. The problem is when it doesn't, there is likely little hedging against possible cost increases. Ontarians may be far more exposed to a surge in natural gas pricing than the residents, and businesses, of adjacent jurisdictions. For electricity, most supply is at a fixed price so the gas exposure will have limited impact. Not so for gas utility bills. As February ended, 2014's annual imports from New York were the highest since 2010, and imports from Michigan (coal) also appeared to be accelerating. Premier Wynne has introduced a poor bill that is sure to be very popular in energy-illiterate circles; it would ban any new coal-fired generators. Such laws are always a bad idea (legal restrictions on building new nuclear, unless absolutely necessary, being a bonanza only for lawyers working towards the death of common sense), but this is a particularly stupid time to introduce this one. There's no plans for any new, firm, generation in the province, so the bill is obviously grandstanding - and that's a sorry substitute for substance. The IESO's estimate of $178 million for February's global adjustment seems, to me, to be ridiculous. My data page is showing an estimate of $30 million, and I'd expect another $40-$50 million on top of that in the OEFC pool largely because coal units, now retired, are likely to receive contingency payments for a contract running through 2014 (thus industrial users will pay for coal, and, especially, pay for the absence of coal). The IESO's estimate of $11.18/MWh, combined with the $178 million total, implies total demand of 15.9TWh; the actual is 12TWh. For the final either the total dollars will be lowered (as they should), the rate raised (it's already recovering more than I estimate it should), or both. The one thing the IESO's 2nd estimate of the global adjustment charges can't be is correct... again (see November's Record electricity Rates: the Global Adjustment/Ontario Roulette story ). 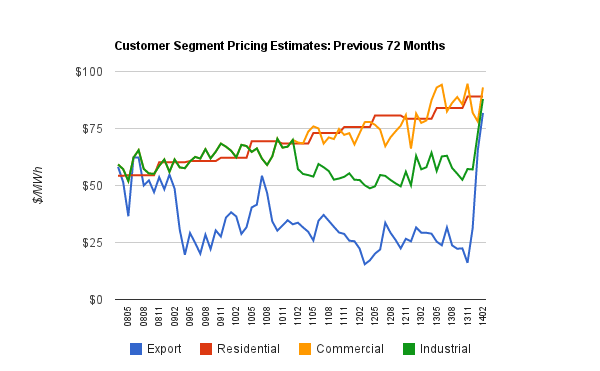 I was somewhat surprised, in loading my preliminary monthly reporting, to note that my estimate of off-peak weighted average pricing is higher than the mid-peak estimate. Similarly, while the average HOEP was ~$81/MWh, the average weighted HOEP for Ontario's rapidly expanding solar output was only $77/MWh. Winter's peaks drive pricing to spike morning and evening, but it's still surprising midday power is priced below the daily average. Wind was again the least valued production, by the market, at $67/MWh (nuclear $77, hydro $83, Gas $100 and imports $79). This refers to what the IESO reports as "Ontario Demand", which is a figure corrupted by their changing definition and the increase in "embedded" generators that, to the IESO measurements, act as negative demand. Accounting for growth in solar generation, actual consumption in Ontario is more likely 3.1% higher in February 2014 than it was Feb. 2013.